Setting up wordpress on Amazon cloud using EC2 is one of the most popular options. You can either use Centos or Ubuntu linux if you are looking for cheaper options without support. Red Hat Enterprise lunux is slightly more costly. We’ll use Ubuntu for this article. When you are starting up, you may want to take a micro instance as there won’t be much traffic initially. In case you anticipate lot of traffic soon, then you can consider small or other instances. First login to Amazon AWS console and click on launch instance. 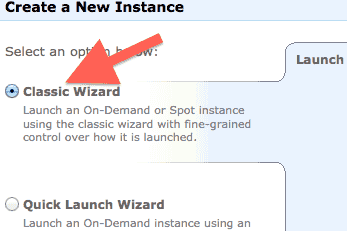 The create new instance screen, choose Classic wizard. Some people may prefer normal release as it has higher version. We’ll choose LTS version. Choose EC2 classic on instance details screen. Proceed with default options till you reach key value screen on instance details. Give a name to your instance. e.g. test-ubuntu-instance. Continue till you reach create a key pair section. Create a new keypair and download it. You will need it later to login. You can also use an existing key pair. Continue and complete remaining steps and launch the instance. You may optionally want to enable termination protection during the setup flow when it is asked. You can do it from EC2 console as well later. I believe this is to prevent accidental termination using API. If you don’t intent to use API, this option does not matter. Once the server is setup, find its name from EC2 console by clicking on instances in left menu. Change the permission of the key pair file (.pem extension) you downloaded to 600. This step is for macbook which should work on any linux machine. In case you are using windows machine, the ssh connection method will change accordingly. If this is not done, ssh won’t work. Replace the keyfile and hostname appropriately. Apache2 is running (pid 3918). In case apache2 is running but web page does not work, you may have to open port 80 using security groups on AWS console. Now open http://yourhostname.com/info.php in the browser. You should see the installed php info. Now download the wordpress (latest version is 3.5.1 as of now), unzip it in /var/www2 dir. Access http://yourhostname.com/ from browser and follow regular wordpress installation process. You will need to download zip utility also for unpacking wordpress download. Use blog as your wordpress db name (or whatever you created) and root as user in installation flow. The default password is blank.You may also want to change it later. Use wp_ as table prefix and leave other settings to default. The web installation flow will ask you to create wp-config.php. Copy the content and create a file wp-config.php in /var/www2/ with this content using vi or some other editor. Create wordpress admin user and password whenever asked. and proceed to login. Thats it! Congratulations on installing wordpress! You can hit http://yourhostname.com/ to view the blog and http://yourhostname.com/wp-admin for writing. AWS hostname may change if the instance is restarted. In one of the steps apache conf file needs to have host name for virtual host configuration. Ideally you should get a domain name and public IP address for your instance and set the DNS aname entry to that IP.